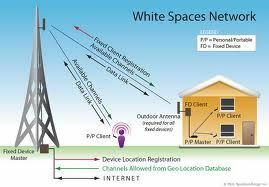 A new form of wireless network known as White Spaces will come online next month, the FCC announced Thursday. White Spaces has been called "WiFi on Steroids" and has been championed by the likes of Google and Microsoft. Spectrum Bridge has been given the OK to become the first active White Spaces database administrator. The FCC says it can begin operations on January 26. The first approved device will be made by Koos Technical Services, and it will work much like a wireless router. White Spaces uses broadcast television signals, which can be picked up anywhere like a broadcast TV signal and then simply tap into White Spaces. A large range of wireless frequencies have always been reserved for broadcast television, much of it unused. Researchers at Microsoft, Google, Dell and other companies, like Spectrum Bridge, developed methods to let data devices like PCs use those blank frequencies.